Lee Jackson Maps - Important Map of the Straits of Magellan. Important Map of the Straits of Magellan. Exquisita & magno aliquot mensium periculo lustrata etiam retecta Freti Magellanici Facies. Amsterdam, 1623. 355 x 470mm. Coloured. 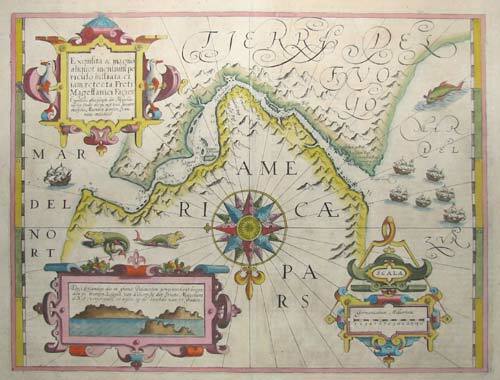 Detailed chart of the Magellan Straits, reflecting their importance at the time, being the only known sea route from the Atlantic to the Pacific. It is decorated with three large strapwork cartouches, one each for the title, scale and coastal profile, a large compass rose over Terra del Fuego, sealions (with manes) ships and sea-monsters. A classic map.